With a common name like “crown of thorns,” this succulent needs some good publicity. You don’t have to look very far to find great attributes. Heat tolerant and drought resistant, the crown of thorns plant is a real gem. You can plant crown of thorns in the garden in warm climates. Read on for tips about growing crown of thorns outdoors. Lots of people grow a crown of thorns plant (Euphorbia milii) as a unique houseplant, and unique it is. Also called crown of thorns euphorbia, it’s one of the few succulents with real leaves – thick, fleshy, and tear-shaped. The leaves appear on stems that are armed with sharp, inch-long spines. The plant gets its common name from the legend that the thorny crown worn by Jesus at his crucifixion was made from sections of this plant. The crown of thorns euphorbia species hails from Madagascar. The plants first came to this country as novelties. More recently, growers have developed new cultivars and species that make growing crown of thorns outdoors more attractive. 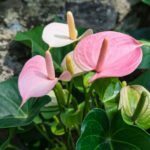 If you are lucky enough to live in one of the warmer areas of the country, you’ll enjoy growing crown of thorns outdoors as a small shrub outdoors. Plant crown of thorns in the garden in U.S. Department of Agriculture plant hardiness zone 10 and above. Sited correctly, the plant offers a mass of delicate blossoms all year round. Crown of thorns is great as an outdoor shrub in warm climates, as it is extremely tolerant of high temperatures. It even thrives in temperatures above 90º F. (32 C.). You can add this flowering succulent to your garden without worrying much about maintenance. Caring for outdoor crown of thorns is a cinch. Plant crown of thorns euphorbia shrubs in full sun for best blossoms. The plants also tolerate salt spray. As with any shrub, a crown of thorns plant needs irrigation after transplant until its root system gets established. After that, you can cut back on water thanks to its great drought tolerance. If you love the crown of thorns in the garden and want more, it’s easy to propagate from tip cuttings. Just be sure to protect it from frost and freeze. You can propagate crown of thorns from tip cuttings. You’ll want to wear thick gloves before you try this, though. Your skin can get irritated from both the spines and the milky sap.